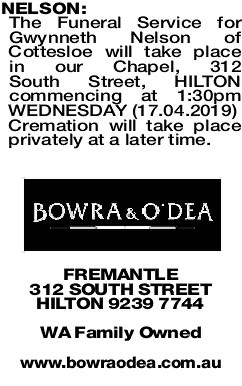 Passed away peacefully on Wednesday 10th April 2019. Cherished wife of Bruce for 69 years. Adored Mother of Robyn and Jillian, mother-in-law of Marty and Ian. Loved Mummar to Ben and Carlene, Aidan and Megan, Kiara, Sarah and Craig, Ashleigh and Dwayne and Great- Mummar to Madison, Georgia, Jordy, Bodhi, Jed and Lani. There is a place in our hearts called memory lane, in it you will always remain. Unseen, unheard but ever near, You will walk beside us throughout the years. 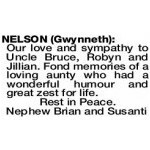 Our love and sympathy to Uncle Bruce, Robyn and Jillian. Fond memories of a loving aunty who had a wonderful humour and great zest for life. 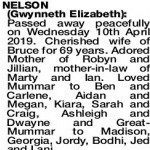 Our sympathy to Bruce and family. Len and Ray. Thanks for memories of a long, happy friendship. 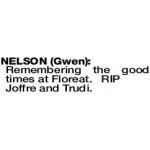 Will miss you heaps. 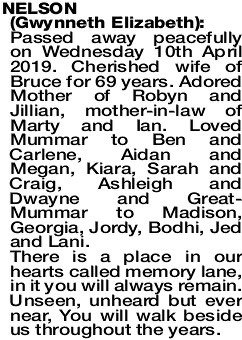 Deepest sympathy to Bruce, Robyn, Gill and families. RIP. From Fran, Philippe and family.